The Bulgarian Association “Adopted and Adopters“ (BAAA) was established in 2004. It supports parents who have adopted children, adopted children who try to cope with the trauma from the parting with their biological mother, as well as adopted people who try to trace their origin. As a result of BAAA’s activities there has gradually been created a community of families who have adopted children and supporting each other. The work model implies creation and maintenance of mutual aid groups of adoptive parents where good practices are shared. Some of the main purposes of the Association are to improve the image of adoption and to popularize the opportunities for support to parents and children from specialists. Over 2 million people in Bulgaria are part of the adoption. Due to the existence of the so called „secret of adoption“, the families who have adopted children remain “hidden” from the public life and the adoption issue is discussed in the media only in case of problems or legislative amendments. The public is not aware of the emotions and feelings related to the adoption process and the adopted children and their parents often find themselves in a position of isolation and discrimination. The adoption issue is quite emotional and is often discussed with negative connotation due to obstacles and abuses of law. 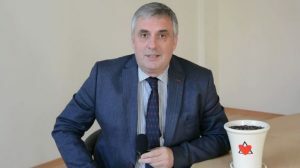 Compared to the international practice where adoption is public and is a role model, in Bulgaria adoption is still connected with secrets, pain, long and difficult adoption procedure and many problems faced by the adopted children and their parents. All that led our efforts to be focused on raising public awareness and shaping public attitudes for a tolerant, humane and civilized attitude towards adoption, which is, sadly speaking, rarely found in our country. We are confident that the adoption is not shameful and it is something beautiful, which should be shared and widely presented! to promote the opportunities of the specialists in the country to provide assistance to the parents and children. 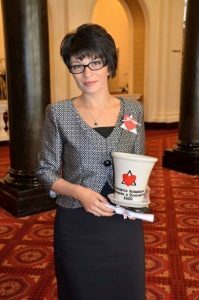 In July 2015 BAAA in partnership with the Ministry of Justice of the Republic of Bulgaria, the National Network of Children and with the support of the Embassy of France organized a forum entitled „The Right to Know Your Origin – the Faces of Adoption”. The forum’s objective was to focus the public attention on the right of the adopted people to know their biological origin. This issue is still not sufficiently balanced in Bulgarian legislation. 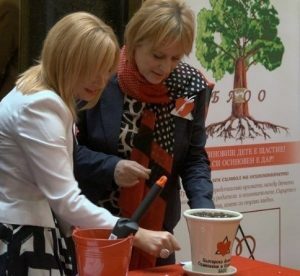 BAAA is the only organization in Bulgaria that has organized a National information day for adoption, which was joined by NGOs providing services for children, municipalities and the State Child Protection Agency (SCPA). In 2015 this initiative was also joined by ministers and members of parliament, as Ivaylo Kalfin – Deputy Prime-Minister responsible for demography and social policy and Minister of Labor and Social Policy made a special address to the initiative. Each of the guests to the forum planted seeds in a pot, as seeds were built in the universal symbol of adoption. They adopted the planted flowers and took them in order to raise them in their working environment. The guests became committed to the adoption process and shared to the journalists what adoption meant for them thus showing that the adoption of a child means happiness, love and care. One year later in the autumn of 2016, BAAA team along with the parents and children will visit the statesmen in order to see how the adopted flowers are doing. Another initiative of BAAA is to celebrate Stork Day. In 2016 the celebration was held on May 17. On this day the child meets its adoption family and the day is celebrated with cake, candles, presents and many friends and guests. Thus the children start to feel that they have two important dates in the first years of their lives. The one is the day when they were born, and the other – the day when they met their family. In this way the children learn that being adopted is not a shameful fact. By this initiative, BAAA aims at encouraging the parents to speak freely to their children about the adoption and not to keep secrets among each other. On March 29, 2016, BAAA was awarded by Tulip Foundation with the award “Project of the Year of an NGO in the Social Area”. This is an acknowledgement for the work in the project „Let’s Not Reject a Child for a Second Time“ as well as for the twelve years of activity in supporting adopted children and their parents. During that project, BAAA created and developed a group of adoptive parents in Gabrovo and produced a documentary film “Triangle of love” which represents real stories of adopted people, adopters and a biological parent. The film was presented for the first time on May, 13 2016 in Sofia. Its second public presentation was held in Bourgas with a cooperation with The Center for social support in the city. In the middle of 2016 BAAA started Project “The friends support each other” which is directed to parents, candidates for adopters and adopted people. During the project, we will meet with families in order to share personal experience and to …. Our aim is to set up mutual aid groups in the cities we visit and to meet the institutions part of the adoption process. The first cities are Gabrovo, Bulrags and Sofia.